In 2006, the iconic Anthora paper coffee cup was discontinued. Nine years later, it's back due to popular demand. Here is its product life cycle, from design roots to the waste dump. In December, the Anthora cup is reintroduced after a nine-year hiatus due to popular demand. 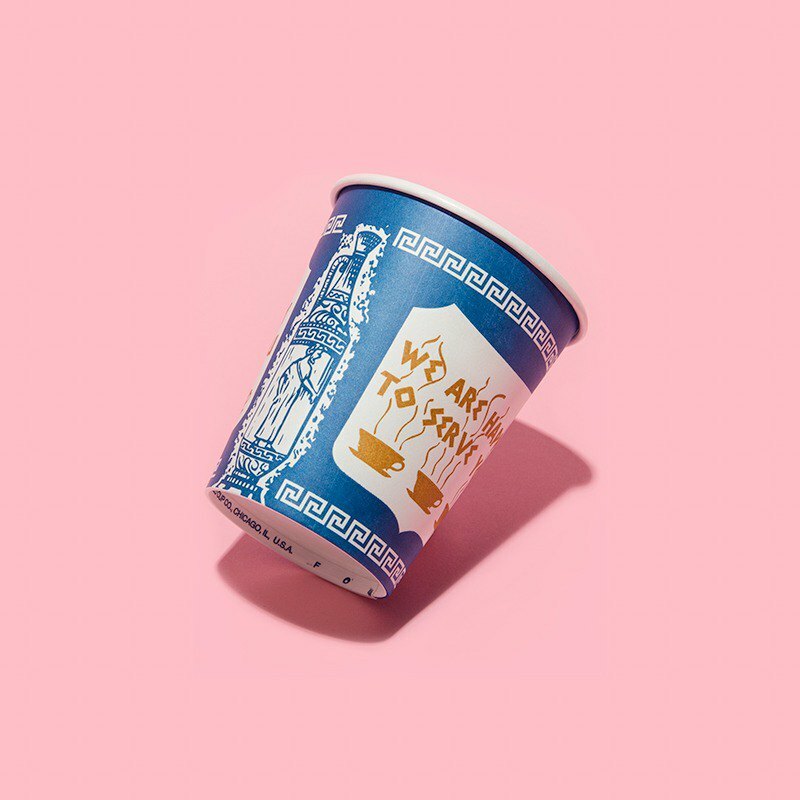 specifically Greek symbol was no accident; most of the to-go coffee in 1960s New York City was sold at Greek-American family restaurants, and the design’s homage to Greek culture made it appealing for merchants, while its warm slogan, “We Are Happy to Serve You,” soon satisfied customers of all backgrounds. The Anthora was the first of its kind, introducing the to-go coffee cup as we know it. Not to say that this was the first disposable cup; William F. Dart invented the styrofoam cup in 1957, and disposable paper coffee cups with handles (still popular in parts of Latin America) have been available since the 1930s. But the Anthora was the first handleless paper to-go coffee cup, innovating a basic design that nearly all coffee shops have come to use since. Initially standing at a very squat 10 ounces when debuted by Sherri Cup in 1965, the contemporary version, sold by infamous red cup creator Solo (ironically now owned by Dart Container, the company started by the same William Dart who created the styrofoam cup that Buck’s invention would overtake), is both taller and slimmer than the original, reflecting the aesthetic stereotype of the City that the cup is most associated with. Today, both 8-ounce and 10-ounce versions are available. Historically, the paper cup used materials from a relatively unregulated network of paper product suppliers. Now, industry leaders such as Dart/Solo source paper from suppliers who have received certification from the Sustainable Forestry Initiative (SFI), a nonprofit created by the timber industry to encourage compliance with state and federal laws regulating the trade. Dart Container has 33 manufacturing plants throughout the world: 23 in the United States (including the corporate headquarters in Mason, Michigan), two in Canada, four in Latin America, three in the United Kingdom, and one in Australia. Paper cups are manufactured using a universal method, which is almost entirely automated and requiring little direct human labor. First, the design is printed onto a long roll of the polyethylene-coated paper, which is then cut into individual pieces, called “flats”. As the name suggests, flats look as though you’ve cut the side of the cup down from top to bottom and flattened them out. The flats are then heat-sealed into cylinders, with bottoms made out of the same polyethylene-coated paper heat-sealed on the bottom. The finished product is a watertight and relatively heat-resistant container made of plastic-coated paper. In this case, the Anthora Cup essentially sold itself; New Yorkers needed coffee, and the Greek diner or deli was where they were getting it. As the first disposable cup without obtrusive handles, it was a matter of convenience for a population known for being on the go. With this in mind, it’s obvious why the cup has become synonymous with New York; Anthora has appeared in countless films and TV shows set in New York City, including, but by no means limited to Law & Order, NYPD Blue and Men in Black. In fact, the design was so important to the aesthetic of NYC that production designer Bob Shaw used it to help convey a convincing ‘90s-era NYC atmosphere for The Wolf of Wall Street. While the cup was nearly ubiquitous from its inception through the 1990s, the transition of coffee sales from diners to coffee shops cut deeply into the Anthora’s popularity. In 1994, over 500 million cups were sold—but by 2005, sales were down to 200 million. A year later, sales were at such a standstill that Solo Cup decided to completely halt the Anthora’s large-scale manufacturing and distribution. 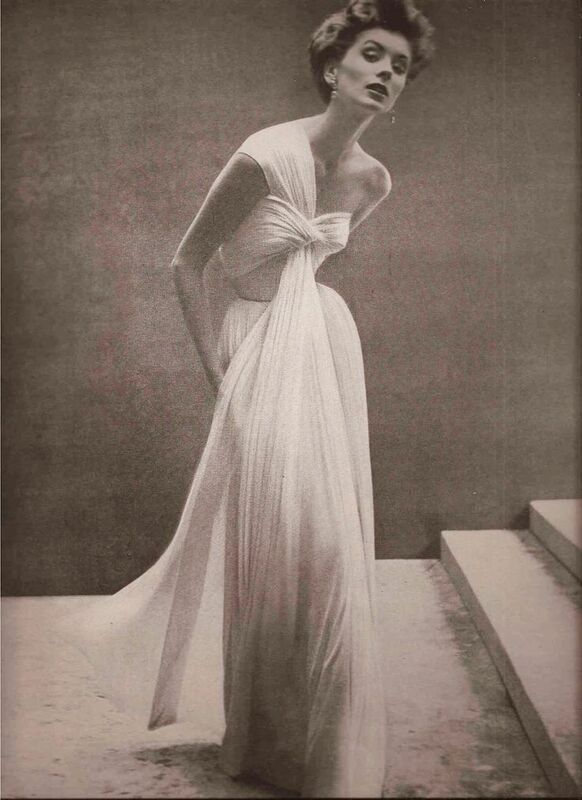 Despite the rapid pace of change in New York, the City is a stickler for nostalgia. So when Dart Container announced that it would be reintroducing the cup in December 2015, it was less the return of an era and more the end of a brief, halfhearted sabbatical. The Anthora cup is certainly back, but it never exactly left in the first place. Unfortunately, the immortality of the Anthora cup carries all the way through its life cycle. The same polyethylene coating that holds a paper cup together and prevents coffee from leaking through makes it extremely difficult to recycle and dramatically reduces its compostability. The popularity of paper coffee cups is rooted partly in the claim that polystyrene foam cups aren’t recyclable—a reputational challenge that Dart Container has had to contend with—but they are actually a great deal easier to recycle than polyethylene-coated paper cups. Dart now directs customers to dozens of polystyrene recycling facilities throughout the United States, mostly on the east coast. Finding a paper recycling facility that will accept polyethylene-coated cups can be much more difficult. There appears to be none in New York City, with the nearest located in Keasbey, New Jersey. 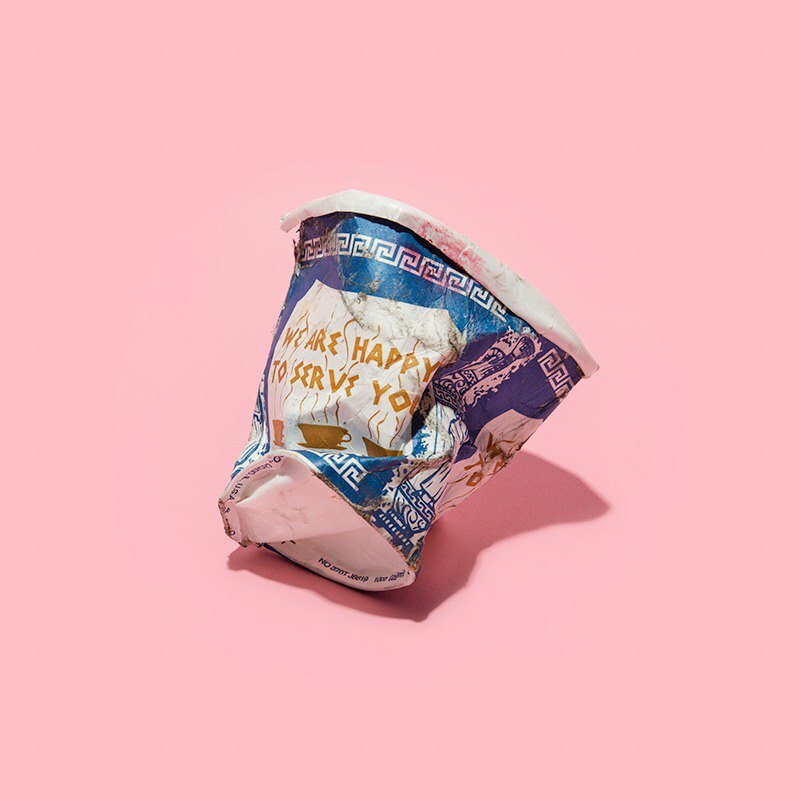 And while the paper in an Anthora cup composts relatively quickly, the plastic coating—which makes up as much as 5% of each cup’s volume—does not. Low-density polyethylene can take up to a thousand years to disintegrate even when exposed to sunlight and, if it’s buried, has no clear reason to disintegrate at all. It is entirely possible that, tens of thousands of years from now, plastic from billions of paper cups will lie undisturbed at the bottom of an abandoned landfill—by which time the Anthora design will be nearly as ancient, in relative terms, as the ancient Greek amphora designs that inspired it. This is not to say that the paper cup industry isn’t taking measures to improve the biodegradability and recyclability of paper cups, but it seems to be a slow and challenging process. Starbucks made a public corporate effort to make 100% of its cups recyclable by the end of 2015, but conceded failure by the end of the year as it became increasingly clear that they were not on track to meet that target. It’s not yet clear how close the industry is to developing a more environmentally friendly disposable paper coffee cup that functions as well as the polyethylene-coated wonders we’re using today, but it’s a safe bet that some of them will feature the words “We Are Happy to Serve You.” So far, the Anthora design has proven to be every bit as durable as the polyethylene that coats it.